The Samsung Galaxy S5 has been on the market for less than two weeks, but there are already rumors circulating for future flagships, which are likely to be released in 2015. Korean publication Ledwn reports that Samsung is already preparing for future devices like the Galaxy S6 and the Galaxy Note 5 and is building a new factory, which will be dedicated to producing flexible displays for them. Though flexible displays have not yet formally been introduced to the market by Samsung, many reports suggest that it plans to implement them in future devices. Samsung unveiled its Youm flexible display technology at the 2013 Consumer Electronics Show and showcased at the 2014 CES a flexible display prototype made with a plastic substrate, which works well with AMOLED displays. Reports did not indicate whether the prototype was made with Youm technology. The Samsung Galaxy Round, which was released in October as a prototype solely in South Korea, was Samsung’s attempt at a curved display device. 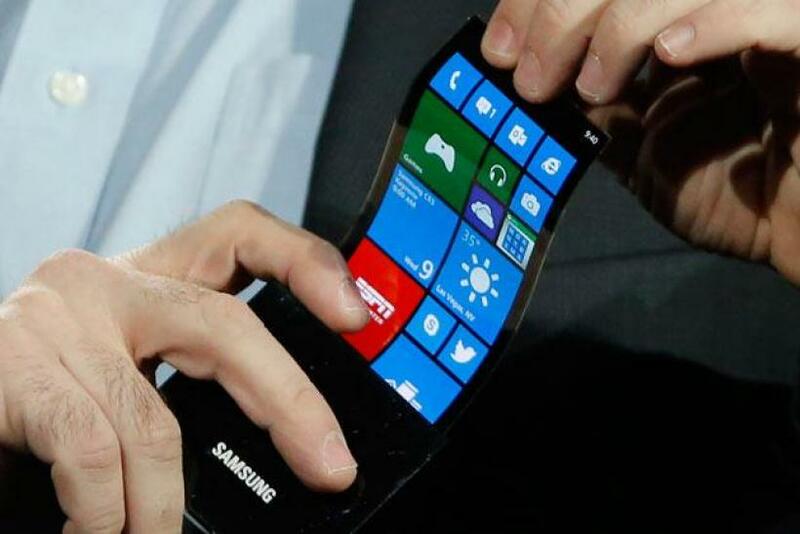 The Galaxy Round, however, reportedly does not use any flexible display technology. Several Samsung executives have also indicated that the coming Galaxy Note 4 may feature a “new form factor,” which many suggest might be a three-sided display, possibly another test before the manufacturer moves forward with its flexible displays. Patents for Samsung design prototypes have also been discovered and connected to the Galaxy Note 4 and this new form factor. Keep in mind that rumors of a Galaxy device with a three-sided or wraparound display have circulated since before the Samsung Galaxy Note 3 was released. According to Ledwn, the new Samsung factory won’t be operational for several months, but the publication is certain that the factory is affiliated with Galaxy S6 and Galaxy Note 5 production. At this time, reports must be taken with a grain of salt. Countless Samsung feature rumors have failed to come into fruition. There were even reports that Samsung had selected several metal suppliers to outfit the Samsung Galaxy S5's exterior, yet the S5 is made of the same polycarbonate material as previous Galaxy generations. Despite numerous new features like its water and dust resistance and fingerprint scanner, the Galaxy S5 has been criticized for not being as innovative as consumers expect from Samsung. Rumors about flexible displays and very high-resolution displays have circulated for many years, but have not yet been introduced on Samsung phones, leaving many to wonder if these features will ever be implemented. However, there is some indication that major hardware upgrades are coming with the 2015 line of Samsung flagships. Chipset manufacturer Qualcomm announced its 64-bit high-end system-on-a-chips, the Snapdragon 808 and the Snapdragon 810, which will reportedly be built-in with new devices starting in the first half of 2015. In addition to 64-bit processing, these chipsets are also expected to bring increased RAM capacities and display resolutions up to 2560×1600-pixels to future devices. Qualcomm is a longtime collaborator with Samsung, so it is likely that future flagships may also feature Qualcomm processors. To continue with its Galaxy S number series, the Galaxy S5 came after the Galaxy S4, so it is likely that an S6 will come next. Additionally, the Samsung Galaxy Note 3 released in late 2013, so many are expecting to see the Galaxy Note 4 release later this year, and the Galaxy Note 5 late next year.